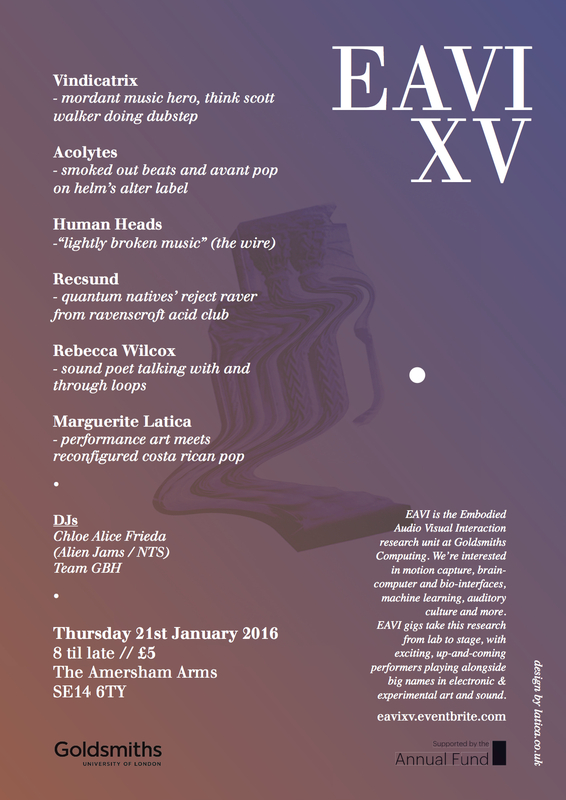 EAVI is back for 2016 with a killer line up! We’re thrilled that Vindicatrix is bringing his inimitable, murky style to EAVI, where macabre, Scott Walker-esq crooning meets the cavernous bass of early dubstep and fragmented rnb. Acolytes is a new signing on Helm’s Alter label, and is soon to go on tour with Helm and Drew McDowall (ex-Coil). He brings a unique blend of smoked (or should that be vaped?) out beats, sliding in and out of ‘pop’, and has drawn comparisons to the Residents and the Art Cows. Acclaimed in the Wire for their “lightly broken music”, Mancunian improv trio Human Heads sound on occasion like Throbbing Gristle reconstructed using keyboards found at a car boot sale, with both uncanny menace and a skewed pop charm. Recsund is the musical moniker of prolific digital artist Clifford Sage. His most recent music is being released on the ever compelling Quantum Natives. He combines glorious acid-tinged melodies with occasional raps and heartbreaking ambiences. Glasgow based artist Rebecca Wilcox has organised and curated a number of exhibitions, including work at the Glasgow International Festival. She is described by the CCA to be “one of the most outstanding young artists working in Scotland today”. She will be performing using spoken word and sounds with a loop pedal. This is the debut performance for the duo of designer / musician Adriana Rojas Viquez and performance artist Cliodhna Murphy. Expect dismantled, disorientating pop (George Michael?) alongside compelling, intriguing performance art. We are thrilled to be having DJ sets from the always excellent Chloe Alice Freida (who hosts the Alien Jams radio show on NTS and runs the Alien Jams label) and Team GBH (the DJ alter ego of recent EAVI performer Quitters). Expect dancing late into the night!